Excerpt of the IESL NSW Chapter Public Lecture delivered on 14th of November 2018 by Professor (Sathaa) Arumugam Sathasivan, BSc Eng(Hons), MEng, PhD. Professor, WSU Water Group, School of Computing, Engineering and Mathematics, Western Sydney University. Prof Sathaa commenced the lecture with the importance of water to the survival of humans by explaining the water-food-energy nexus. Water is an essential for all facets of life including food production and energy production. Agriculture is the single most consumer (70% of total water demand) followed by industrial consumption – out of this 75% is consumed for energy production. With the forecast of 55% increase in water demand by 2050, water demand is expected to increase by 50% even with all the expected efficiency gains. Staggering fact of water is that the society (especially inland community) can hardly survive serious drought and recent Syrian war, Johannesburg water shortage (announced to cut water in April 2018 to its public) are examples of how climate change can seriously affect the economies and the community as a result of shortage of water. The presentation then introduced the historical development of sanitary engineering field starting from the cholera pandemic in Thames River which killed more than 10,000 people in 1850s when the knowledge of microbial pathogens hardly existed. Starting from the investigation of the incident several others established the disease-spread mechanisms as faecal-oral route. That is the contamination spread through contamination of water with faecal matter. He then explained that, the chlorination, the most significant public health advancement of the millennium, resulted in sudden decline of typhoid fever/death episodes across the US from its application in 1908. The talk then highlighted the continued presence of waterborne disease – especially Legionella Pneumophilia in hot water systems. The Legionella is not mainly the problem of water supply system, but when water is heated to produce warm temperature and the microbes travel through aerosols. He also pointed out that most recent significant concern in water supply system is also contamination of water supply with faecal matter from animals which can contain a large amount of larger microbes – protozoa. Major protozoa of concern are Cryptosporidium and Giardia which have escaped traditional water treatment processes. Hence, the importance of catchment protection from animals. The traditional water treatment process consists of coagulation, flocculation and sedimentation followed by chlorination for surface water such as river or lake water. Many other water quality issues of drinking water system were discussed. Bacterial regrowth is one of the issues in water supply systems when disinfectant residuals gradually decrease as the water travels through the water supply system. It was noted however the presence of such microbes is not always harmful since most of these microbes are proven to be non-pathogenic as was concluded in many investigations. Water supply authorities monitor for one group of bacteria namely coliforms to ensure that the faecal contamination does not exist. The next issue discussed during the presentation was the suspected carcinogenic disinfection by-products (DBP) from Chlorine reacting with the natural organic matter present in the water. Disinfectant disappearance and DBP formation are the subjects of research by many groups including Western Sydney University (WSU) Water Group. The WSU research groups work on modelling and optimisation were discussed. The another challenge faced by the water industry is that endocrine disruptors (pharmaceuticals) present in water bodies from wastewater treatment plant effluent, currently many wastewater treatment plants are incapable or doesn’t have technology to remove them. The presence of antibiotic-resistant microbes due to the use of antibiotics by the public is another concern since the antibiotics will not work against them. The presentation also touched on the need for civil engineers to be aware of water quality impact of water system design. Especially the message was to advise Hydraulic Engineers to avoid small pockets of water with longer retention time such as allowing stratification in service tanks. Emerging water treatment technologies such as membrane filtration, capacitive deionisation; graphene filtration etc. were discussed, but most importantly it was emphasised that the cost of water cannot exceed the 3% of annual income to make it affordable and under this perspective, Prof Sathaa argued that the new technologies would be only slowly adopted. Recycling was highlighted as an important means of achieving the increased water demand but the resistance of the society to accept the direct potable re-use. On meeting the increased demand, the presentation emphasised the importance of matching the needed quality/quantity with available water quality/quantity to minimise the treatment/transport infrastructure requirement and to ease the strain on good quality water. Examples of recycled wastewater used for toilet flushing in Japan, to augment raw water reservoir in Singapore and recharge aquifer in Western Australia were highlighted. A win-win reuse in Kwinana eco-industrial park where desalted recycled wastewater is reused for cooling tower rather than the desalted scheme water is also discussed. Prof Sathaa touched specific issues faced by Sri Lanka, in terms of rural issues such as, arsenic/fluoride pollution, salt water intrusion, ground water depletion. He mentioned that the ground water depletion and salt water intrusion are major concerns in coastal areas of Sri Lanka where heavy uncontrolled utilisation of ground water occurs and he emphasised the importance of finding a lasting solution to the issues and he stated that he would be happy to help to resolve challenges faced by Sri Lanka. Arsenic/fluoride pollution is widespread in many south Asian countries. In many cases the public utilising the water are not aware of the presence of such contaminants and in some cases occurrence of diseases are correlated to not only arsenic/fluoride but also many other causative agents including pesticides in water. Technologies such as SODIS®, Omnipro® etc. are discussed. The presentation concluded with future outlook on emerging technologies and issues and a possible future landscape. 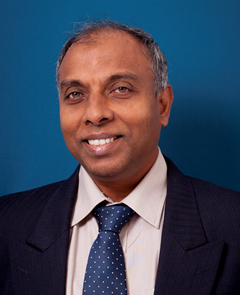 The speaker, Prof Sathasivan has over 28 years of experience in water and wastewater engineering. He has published over 100 articles and supervised 15 PhD and 20 MPhil graduates to successful completion. He has attracted over $4M in research grants and consultancies. He has made significant contribution in quantifying “the unquantifiable” disinfectant disappearance and associated chemical and microbial risks. This has led to scientific discoveries of different factors and deterministic optimisation of operation of water networks. His overall work is focussed on delivering high quality drinking water to public while minimising cost. He is the leader of Smart Water Group in Western Sydney University. His team’s services are frequently sought by a number of water supply system operators across Australia ranging from large operators like Sydney Water and Seqwater (Brisbane) to small utilities such as Harvey Bay and South Gippsland Water. His team played a decisive role in recommending the future of water treatment strategy for Brisbane Water Supply Systems and now working on future disinfectant strategy for Sydney Water. The live-broadcasted presentation is available at IESL NSW Facebook Page. If you would like to contact Prof Sathaa for clarification or any other assistance, you can contact him directly by emailing to S.Sathasivan@westernsydney.edu.au and he confirmed that he is happy to extend a helping hand. IESL NSW Chapter would like to thank Prof Sathaa for the well-designed presentation which catered for a wide audience. The information presented during the lecture was simple and easy to comprehend. The lecture was well attended. How well the audience received his lecture was witnessed during question and answer session, when members of the audience queued up after the presentation to meet Prof Sathaa.